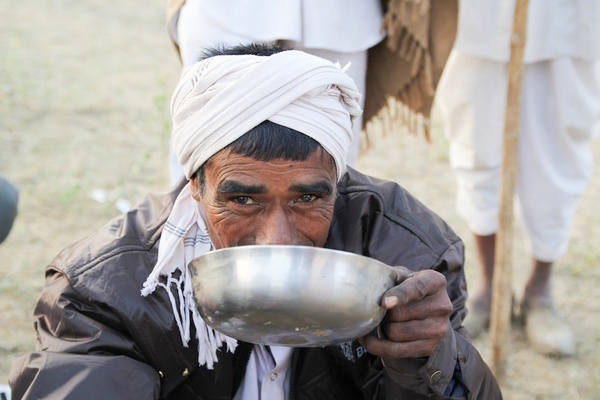 A camel herder sipping hot, camel's-milk chai. All photos by Zach Marks and Resham Gellantly. Zach Marks and Resham Gellantly traveled from Rajasthan to Mumbai meeting the people who make and sell chai tea for an about the role chai wallahs play in Indian communities. 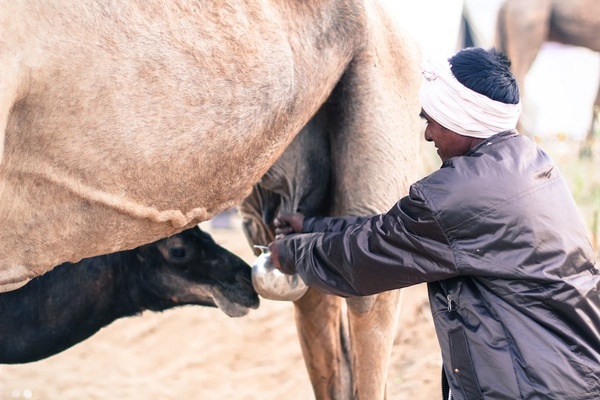 They stopped in Pushkar to watch locals make a camel's-milk version from scratch. PUSHKAR, India – Camel herding is in Durga Singh Rathore's blood. "We have been here in Rajasthan working with camels for hundreds, probably thousands of years," Mr. Rathore said. "Camels are our cars when we have to go somewhere. They are our trucks when we have to move our things. They are our tractors in the fields. We use them for everything." 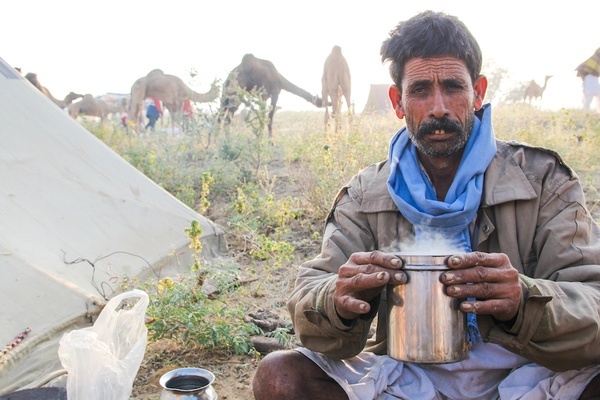 So it's no surprise that Mr. Rathore's family uses camel milk for their morning cups of chai. Step one — milk the camel. We found ourselves in Pushkar for its annual camel mela, a weeklong festival during which this small Rajasthan town swells with tourists, camel traders, and Hindu pilgrims visiting the Brahma temple and taking a dip in the holy lake during the Kartik Purnima full moon. Herders from around Rajasthan bring their camels to the mela ground just outside the city where a sea of camels — some 50,000 of them — stretches across the sand as far as the eye can see. 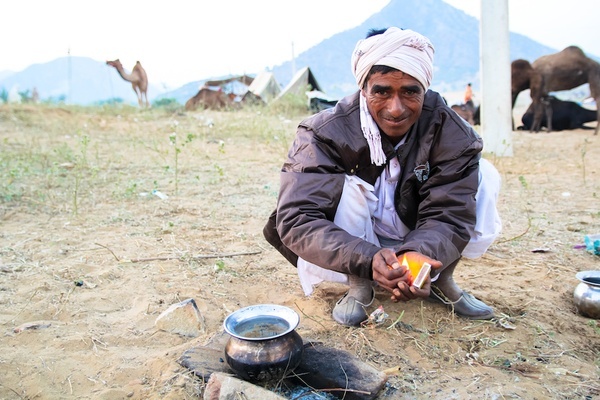 A camel herder builds a fire to heat the milk. 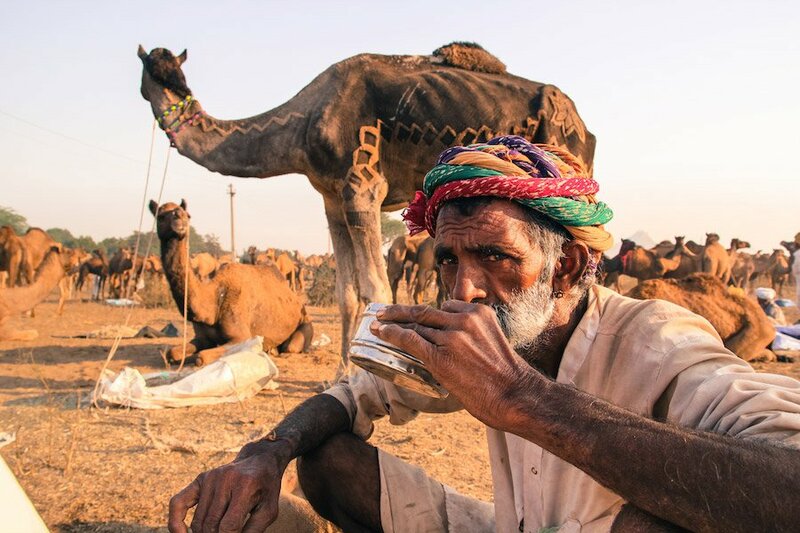 Mr. Rathore traveled to Pushkar on foot, walking five days from his home in Bhadwa, a village in Rajasthan's Nagaur district, with his brother, son, wife, and a young male camel he wanted to sell. "It was too strong and was getting out of control, trying to bite us," he told us. (The day before, we had met a herdsman who had been the victim of a camel bite; his right forearm was indented where the camel had taken a piece of his bone and it felt like jelly to touch. We could understand why Mr. Rathore was keen to avoid this fate.) "Plus, we didn't have enough work for it, so I sold it for 35,000 rupees." Which is about about $550. To replace it, he bought an older male for 22,000 rupees along with a female and her newborn calf for 20,000 more. Hot camel's milk that will be steeped with chai. Acquiring a recent mother came with an extra perk: "Camels have the best milk right after they give birth," Mr. Rathore's wife Om Kumar said. To make her point, she filled a tin with milk squeezed from the camel's udders and added it to a pot of tea boiling on a fire of camel dung and sticks. After adding some sugar, she poured cups for her husband, her brother-in-law, her son, and us, her two foreign visitors. The chai had a note of the desert's mustiness and the camel milk was a bit salty, but it was the perfect start to another day of trading at the camel mela. Hot camel's-milk chai is ready to enjoy. "We use camel milk for chai and for kheer," Mrs. Kumar smiled as she talked about the sweet rice dessert. "We used to drink more, but now we use more buffalo milk since we have fewer camels." 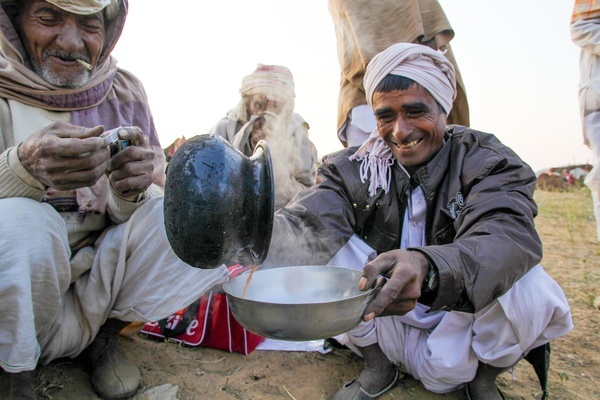 Indeed, times are changing for Rajasthan's camel herders, as we learned over our cups of chai. A camel herder enjoying the finished product. "The era of the camel is over," explained Mr. Rathore and Mrs. Kumar's son Somer Singh, taking a hearty drag of a beedi cigarette. "There are machines for everything now. They are expensive to buy, but more and more people have them." Mr. Singh said his family's tradition of camel herding may end with the next generation. "We didn't go to school. My son goes to a good government school. He will get an office job when he grows up." Even so, Mr. Singh insisted his family will always have a few camels around to provide enough milk for the morning chai. "Working with these animals is God's work. This is what our people do." Zach Marks and Resham Gellatly are traveling around India , the roadside tea vendors who are a constant presence around the country.